Are you entertaining this holiday season—or would you like to take a dish with you to any holiday parties? Here’s an appetizer to serve that combines the salty-savory taste of prosciutto with creamy sweet potatoes. If you’re looking for additional appetizer ideas, I recommend you try making my Green Goddess Dressing to serve as a dip with fresh vegetables; Sweet Potato-Salmon Cakes for your pescatarian friends; or simple Spiced Nuts. You can find more appetizer ideas here. Put the sweet potato pieces in a pot and cover with cold water and a dash of salt. 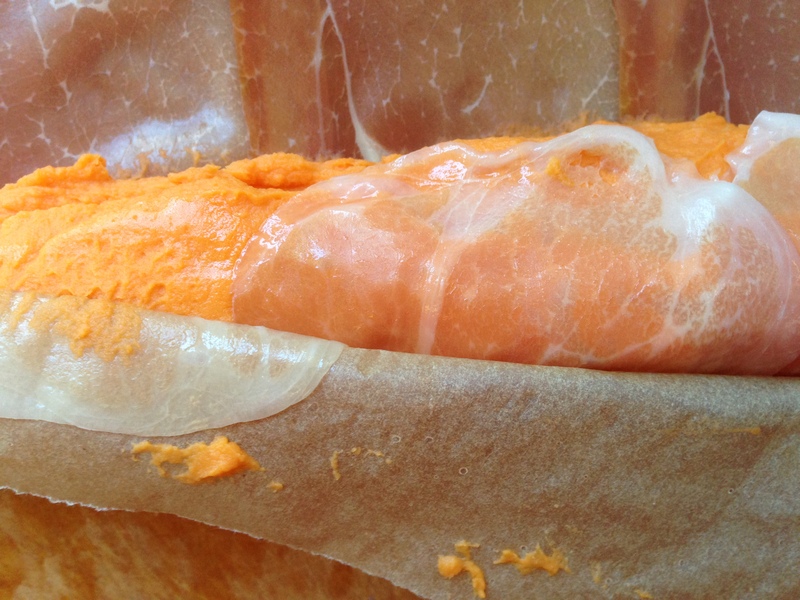 Cook sweet potatoes until tender and drain off any excess water. 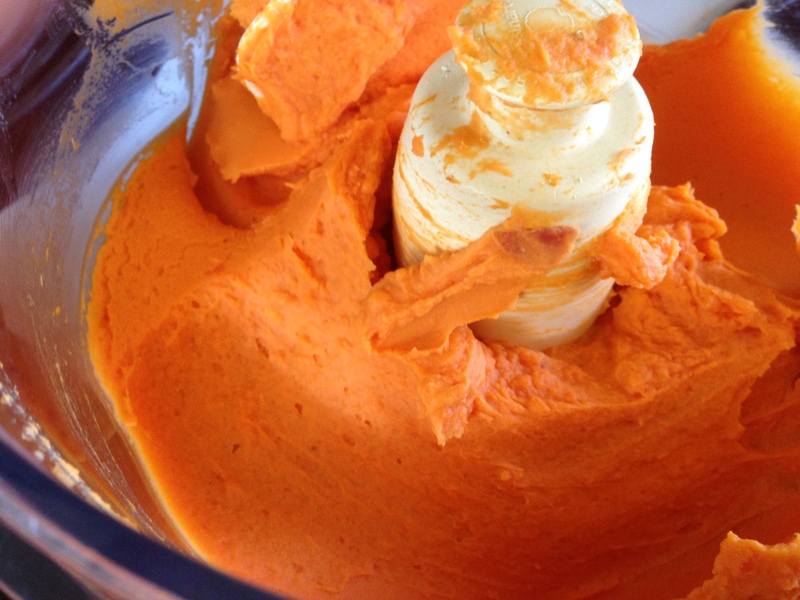 In a mixer, or food processor, mix the cooked sweet potatoes with butter, dijon mustard, and egg yolk (if using). Season with salt and white pepper to taste. Let potatoes cool slightly before wrapping in prosciutto. 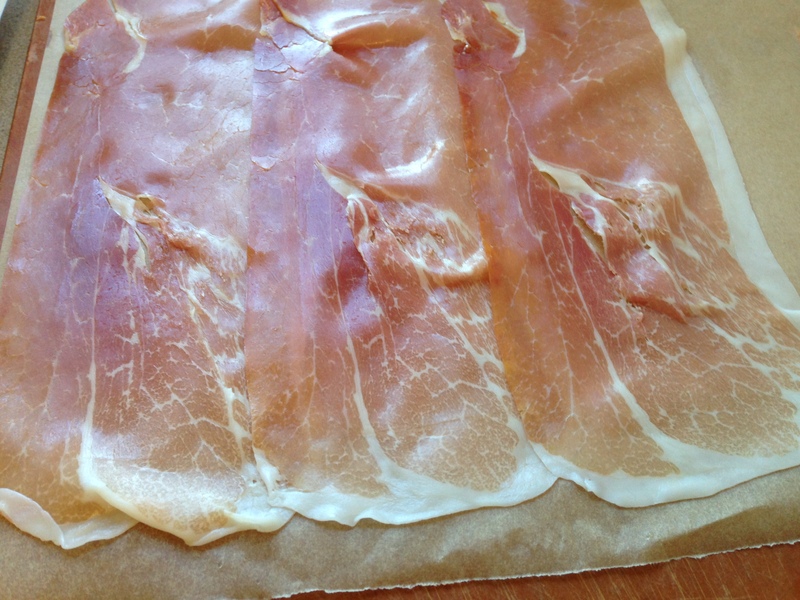 Lay a thin strip of prosciutto lengthwise on a piece of parchment paper. Layer another next to it, overlapping slightly along the long side and continue until you have used about 4-6 pieces of prosciutto. Tina’s Tip: I live just up the hill from a Costco store, and since I will be making many of these for the holiday season, I purchase my Parma prosciutto from there. Generously spoon the mashed sweet potato horizontally across the bottom third of the prosciutto strips (the end closest to you). You should use about half of the mixture when you do this. Starting with the end nearest you and using the parchment paper to help you shape and hold the roll, roll up the prosciutto, rolling away from you. Shape the roll and pack the ends as you go to evenly distribute the potato mixture. Take care not to let the parchment get stuck inside the roll. 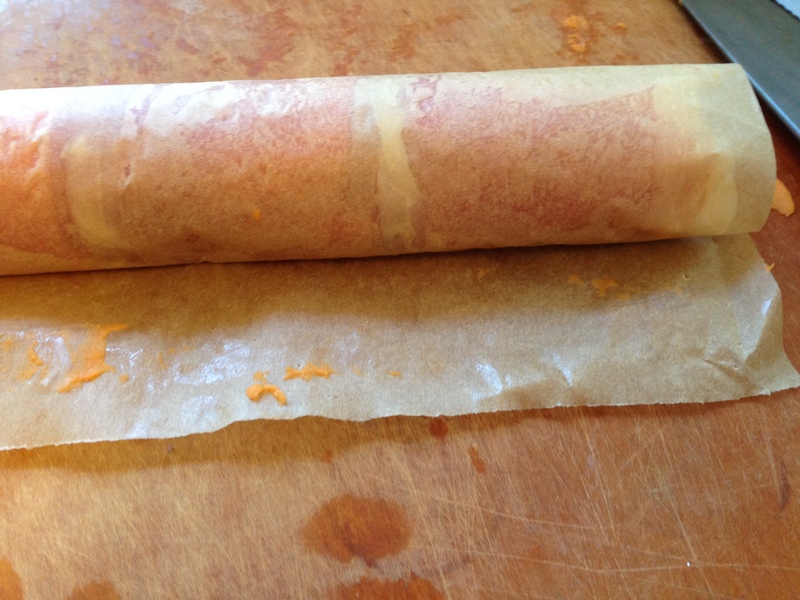 At this point, the prosciutto and sweet potato roll should be held together with the parchment wrapped around it. Using a very sharp knife, cut four to six even slices while still keeping the paper wrapped around the roll. 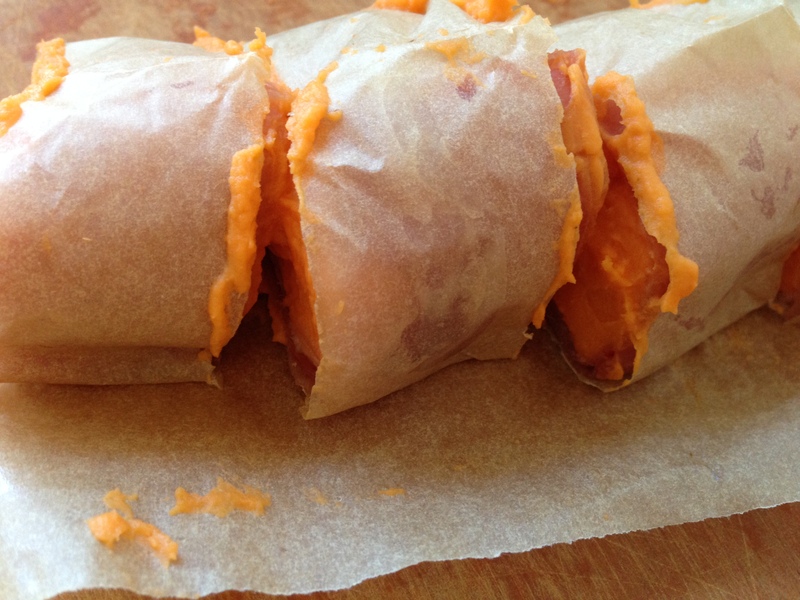 Take care not to put any pressure on the roll or you will squeeze out the sweet potatoes. Gently unwrap the parchment from each piece of the sliced roll and dust a little flour on all the ends. Set aside. 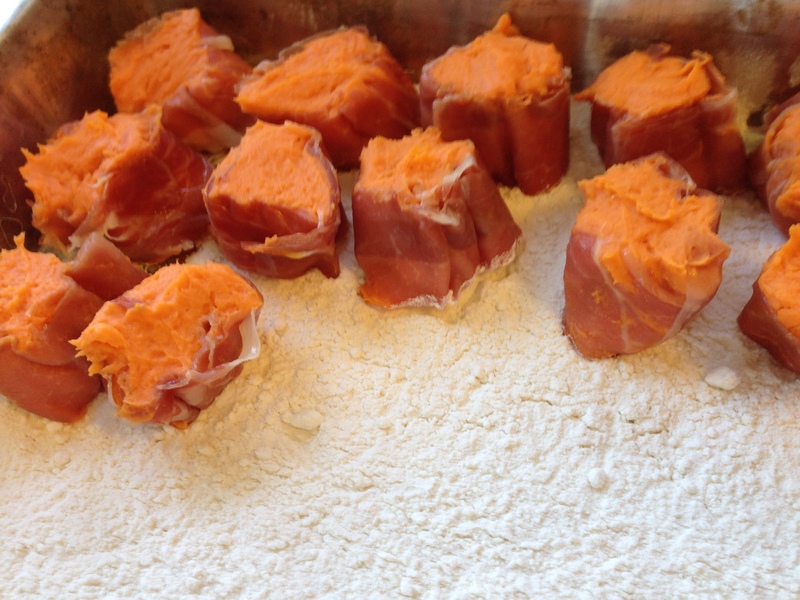 Repeat the rolling and cutting steps with the remaining prosciutto and sweet potato mixture. Heat a pan over medium heat until warm. Add a little oil and fry both ends of each slice until browned, adding extra oil as necessary. Place slices upright on a baking sheet. When all pieces are fried, place the baking sheet in the oven and bake for 10 minutes. 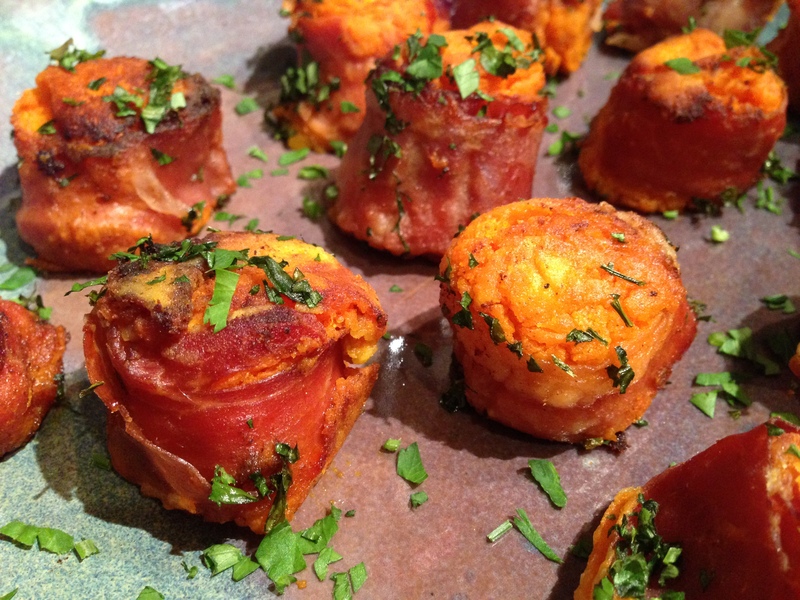 Tina’s Tip: This is also a fun way to use up leftover roasted sweet potatoes, if you made extra for a holiday dinner. Note: I found this recipe on the Jewels & Jill website. 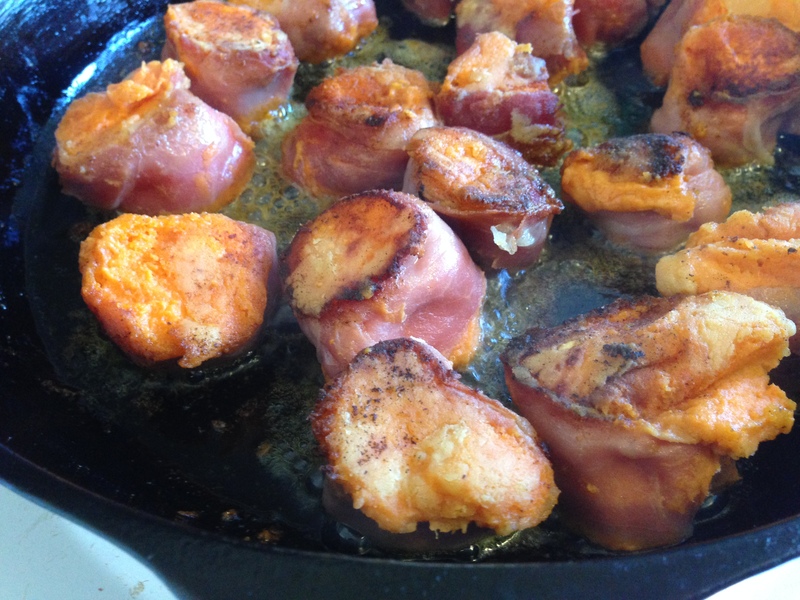 This entry was posted in Appetizers, Meat, Recipes and tagged Pork, Snacks, Starters. Bookmark the permalink.